Remember when a death on The Walking Dead felt like a vital and meaningful moment? When it would come out of nowhere, throwing a wrench into what we thought was the narrative, and shaking up the post-apocalyptic existence of our group of survivors, forcing them to come to terms with the callous and unpredictable nature of their lives yet again? Because after a long time—and some of the clunkiest storytelling this side of season two’s barn—this episode captured that bleak but vital spirit of the series once more, highlighting the best and worst of its tactics in a way that showcased what can still make it, lo these nine seasons in, feel like the thrilling and strange show unlike anything else on TV. If “Warning Signs” was this season’s high-water mark for showing how the series can evolve into something new and better, “The Calm Before” was an elegy for the old days, an excellent tribute to everything that used to make it compelling in its early years. The whole thing is basically an episode-length equivalent of the scene in the horror movie where the character goes upstairs to investigate that strange noise, and the entire theater starts yelling, “Don’t go up the stairs, you dummy!” (It’s literally titled “The Calm Before,” for god’s sake.) Only instead of it ending in that character’s death, it plays out as though that character came back downstairs to find their spouse, their children, and their neighbors all murdered while they were off on the second floor. It’s gory, gratuitous, and exactly the right move. The trade fair begins, but the various community leaders are all too aware of the potential threat to Hilltop from the Whisperers (they understandably assume Alpha will think Henry and Lydia have returned to the place that first sheltered them), so they dispatch a group of fighters to protect it. When those folks come upon the scene of an attack, they follow the trail in hopes of locating survivors, but instead find themselves surrounded and disarmed. Alpha delivers a warning to Daryl—stay in your lane, or we’ll unleash a horde of walkers upon you—and tells him they’ll leave a marker at the Northern border of their territory to know not to go any further. When our people arrive at that marker, it turns out to be the totems of a massacre: 10 severed heads, their walker mouths still moving up and down—including Frankie, Rodney, Addy, Ozzy, and Tammy. Oh, and Enid, Henry, and Tara. Part of the problem with telling a story that involves a new villain roughly each season is that it becomes increasingly challenging to ramp up the threat level above and beyond what’s come before. If the new menace doesn’t pose as big a danger as the last one, it feels like a drop in narrative stakes and a slackening of the tension. And when you’re nine seasons in, that strain is apparent. (Hell, by the time Buffy hit season five, she was fighting a literal god, and that story ended with the title character’s death.) The show has already gone as far over the top as it could with the cartoonish theatrics of Negan and the Saviors, so the arrival of the Whisperers this year was a refreshingly back-to-basics reintroduction of horror and uncertainty, a way of acknowledging they couldn’t go bigger, so it had to go darker. It’s not just the scale of the slaughter, though having this many characters we’ve gotten to know bumped off at once is a feat that has, to my memory, never happened in the history of the show. The sheer numbers convey a brutality and overwhelming threat that emphasizes the possibility for massive violence that Negan, for example, always made clear he hoped to avoid. But it’s also the way it was done: There was no depiction of the murders, no moment of button-pushing tragedy as we watched someone breathe their last, or eyes go wide in shock as a blade, a bullet, or a walker bite struck them down. 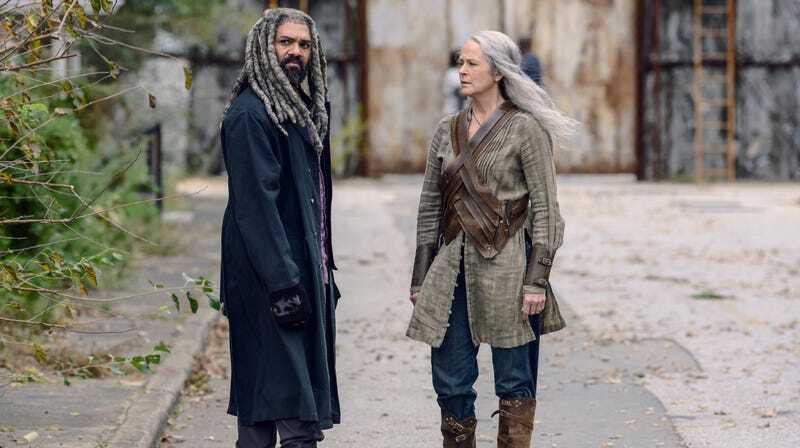 It happened entirely off-camera, the better to have the force of its impact land with viewers at the same time as it did with Daryl, Carol, Yumiko, Siddiq, and Michonne. It maintained its gut-punch force, a rare and potent twist at this point in the series. And thirdly, it’s the significance of the victims: This is a show that never wants to let more that one cast member die at a time (Abraham and Glenn excluded), the better the drag out and maximize the emotional tug at the other characters’ heartstrings. When the pikes first appeared, I assumed we’d get a few marginal characters, like Tammy and Addy, and then finish it off with one more major character. And while Enid is a pretty major death, she’s never had that central a role in the series, nearly always working as a supporting player in B-stories and other people’s central plots. But Henry, much to the displeasure of myself and many others, has been a key part of this season, and offing him is significant, mostly because of the effect it will have on the people we actually care about. Poor Carol, in particular, is going to be dealing with the emotional fallout of this for some time. R.I.P. Tara, though! While I understand the show’s decision to have Henry’s death come last, given his centrality to the preceding episodes and current storyline, it feels like the poor leader of Hilltop got short shrift in her goodbye. Alanna Masterson’s Tara is by far a more interesting (and more likable) character, has been through far more, and had the most impact on the narrative of any of these people. Having her admittedly shocking death be second fiddle to Henry’s is a bit of a disservice to how it plays for an audience that has spent six season with her. Far more than Ezekiel and Carol’s adopted son, Tara’s death is what makes this reveal land as something meaningful and horrifying. Hers was also the one that was arguably telegraphed a bit, however. Her little speech about how she wanted to come back to Hilltop as a leader they could trust and respect had a few too many shades of Jesus’ last thoughts, the show overplaying its hand with its go-to move of “character finally seems comfortable in their role in life” being the signal of their demise. Also, it gave us the deeply weird exchange with Gabriel, where he stares just a little too long at her with an odd smile, and the camera lingers a touch too late on his visage while this happens. It may have been meant to signify fond appreciation of this confident women having grown into her own as a leader, but it played like a creepy beat of a stalker eyeing his prey. “Is he about to murder her?” my viewing partner asked me, and it really did come across like something unsavory, a misfire of staging and execution. Nonetheless, because the episode effectively conveyed the ticking clock of danger, signaling that this was a countdown to disaster (as announced by the opening sequence of the happy couple killed by Alpha, the Whisperer leaning in to scalp the woman whose hair she would later wear as a disguise in the Kingdom), it made the fun and light-hearted moments of the fair that much more effective dramatically. The signing of the Charter could’ve been stretched out, but instead it’s almost an afterthought here, a symbolic display of these people’s renewed commitment to one another. Luke and Alden sing songs; Lydia gets to go to the movies; Connie and Kelly have a heart to heart; shot after shot of smiles and affectionate embraces provided the right kind of simultaneous palate cleanser for what came before and preparation for the ending. At best, “The Calm Before” could be a memorial for what this show has been as it heads toward a new future, a reminder of what it used to look like during its strongest seasons, before reshuffling the undead chessboard of its major players and changing up the nature of its structure and stories. “Warning Signs” showed this was possible, and the Whisperers are an ideal foil by which to engage in some ambitious new ways of dealing with these characters and communities as they enter a new era of existence. True, this show hasn’t demonstrated anything like the kind of consistency that would point to such a maneuver; continuing its uneven mix of soap-opera melodrama and intriguing experiments in post-apocalyptic thrills is the likely progression. But as we close the book on season nine and look to the show’s 10th(!) year, this was an excellent reminder of what got us all tuning in in the first place. 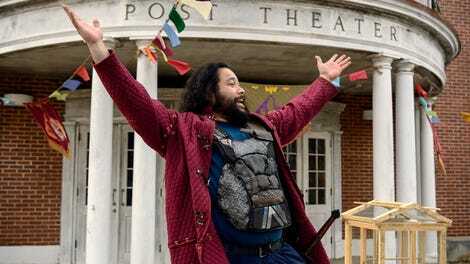 Ezekiel: “Our son is taking a girl to the movies tonight.” I couldn’t help but smile at the nostalgic charm of that line. I also liked how the episode didn’t linger on Daryl’s realization that Beta was still alive. Improbably named returning director Jeffrey F. January did strong work here. It’s hard to feel bad for Rodney’s death when he and Gage were such teenage assholes right to the end. Poor Addy, though. R.I.P. Angus Sampson’s highwayman, Ozzy. You’re always a welcome presence on any show. Rosita telling Eugene not to push it after he invites her to the “RPG campaign” was a similarly nice beat. Alpha showing the walker horde to Daryl is a strong narrative conceit, the equivalent of warning your enemy by holding up an ICBM and saying you’re not afraid to use it. Even the final speech by Siddiq worked for me; it was exactly the sort of encomium the community needed to hear, and a nice sendoff for the characters.